Christmas always seems to creep up on us way too soon, and can be a stressful time for everyone so it’s important to remember to have fun and make time for family and friends around the festive period. It’s easy to forget in the midst of all the preparations that is what Christmas is all about! For a slightly different experience this Christmas, why not organise a trip to a racecourse for a really fun outing with family or as an office Christmas party with a difference? If you’re a summer races fan, taking the racing experience to winter is a real treat, plus if organising as part of a work event you are guaranteed to see your colleagues in a whole different light once their competitive streaks kick in! Kempton is an ideal option for an informal and welcoming family / staff friendly venue – and they have developed several budget-friendly packages for fun festive outings. Ideally located between Sunbury and Hampton Court on the A308, South-West London, Kempton is easily reached by either road or rail from London Waterloo. The racecourse even has its own rail station – Kempton Park – which sits just 200 yards from the main entrance, so getting there and home is a breeze. Kempton Park is one of the busiest racecourses in Europe, hosting jump racing from October to April, and afternoon and evening flat racing on the all-weather track throughout the year. The highlight of Kempton Park’s racing calendar is the Grade 1 King George VI Chase held every Boxing Day as part of the William Hill Winter Festival. 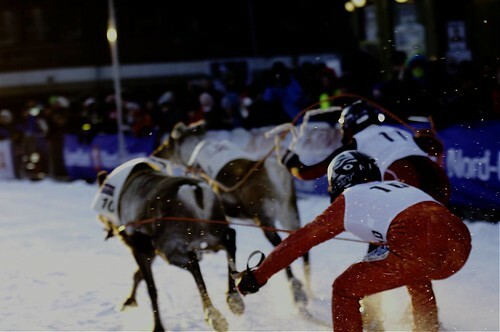 Aside from the traditional horseracing events, there are also some truly novelty Christmas treats available which kids in particular will love – the most striking of which are the reindeer racing Christmas parties! As well as the amazing spectacle of reindeer racing, an entry of Shetland ponies and jockeys are also taking to the track this festive period. It’s the perfect chance to enjoy a Winter Pimms and place a bet on your favourite reindeer to win! Plus, a surefire way to keep the kids entertained. If hunger strikes, there is a great range of eating options at the venue including the Panoramic Bar and Restaurant as well as plenty of tasty fast food which won’t break the bank. Who knows, it might be a glass of bubbly to celebrate your win! It’s not just horse (and reindeer!) racing at Kempton – the venue is also host to several regular markets including one of the UK’s largest outdoor markets every Thursday and the Sunbury Antiques Market twice a month. There is a wide range of goods for sale from clothing to groceries, so it’s well worth a trip pre-Christmas to buy some last minute gifts for friends, family, or perhaps a treat for yourself! Have you thought about some winter husky sledding as an option for family fun around Christmas? You don’t need to go to Scandinavia for a husky experience, with UK companies offering this on your doorstep! Gloucester-based Arctic Quest offers sled dog adventures, including various options for ‘husky mushing’! This would be a fantastic experience for a family or a group of friends alike. It would also make an excellent experience’ gift idea for those who are impossible to buy for! Finally – if your tastes run towards the more active activities, there are a number of indoor skiing facilities now available in the UK and great to get the whole family warmed up to the slopes in advance of a ski trip abroad (or simply as a great activity in its own right!) Check out Chill Factore in Manchester for a Winter Wonderland on your doorstep, no matter what the weather may be like outside.